The AR500 Armor® Weighted Training Plates are constructed from military grade ½” MIL-A 46100 steel plate. 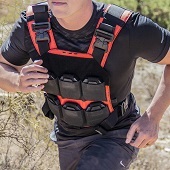 Specifically designed for use in our Atlas Adjustable Weight Fitness Plate Carrier, or AR15 magazine pouches. Our Miniature Weight Plates weigh in at 1.6lb each, and can be used in any or all of the 12 mounts on the Atlas to fine tune weight for increased resistance. Alternatively, you can load our Miniature Weight Plates into your standard AR15 magazine pouches for training purposes.